Day before Opening Day... Hooray! But today, he read me the best baseball story I've heard all year, about the Chicago Tribune's contest to have readers come up with protest songs flying in the face of the news that filthy rich owner Sam Zell wants to rename Wrigley Field. You've got to watch the You Tube video of the winner. Click here. It's a scream. Hubby got up and went over and shook Lou's hand. Gives me chill bumps just thinking about it! Anybody want to meet me at the game Monday for a bite? I'm buying. I was blown away by the quality of the ingredients in this innovative take on risotto, barley standing in for arborio rice. 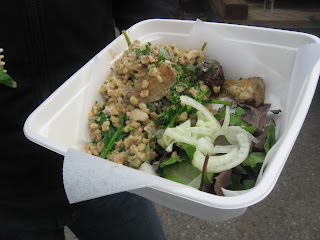 The setting certainly was at odds with the classy menu served from an Airstream at various locations around Seattle. Earlier this week, I had lunch at the industrial hood known as SODO. (Think "Blade Runner".) And wrote about it in today's P-I. This dish was distinguished by roasted golden beets, broccolini and shaved fennel. And, get this, it was just $6. This moveable feast can be a little maddening. No showing sometimes. Cutting off orders during the lunch rush. Next time, I'll go early. Because it really is some of the most interesting (and crazy cheap) eats I've had in the city. 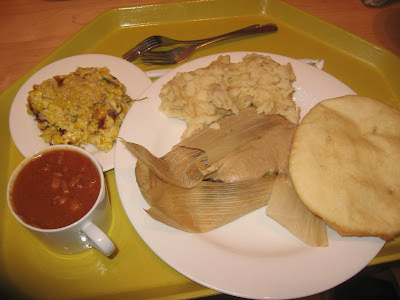 Buffalo chili, black bean tamal, corn pudding, mashed yucca and fry bread, oh my. 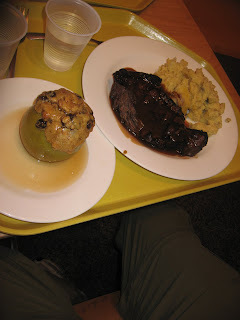 Had quite an amazing feast recently at the National Museum of the American Indian in D.C. 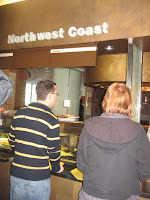 The cafeteria is arranged in geographic regions, and the Northwest Coast was well represented. Wild salmon from the Quinault tribe, cooked over an oak fire. The buffalo ribeye, too. (Pictured on the right, along with a stuffed apple. This was some of the best food I ate during my trip. I wrote about in my dining column in the Seattle P-I. Love to hear some thoughts on bringing more First Nation fare to the table in local-centric Seattle. I'm having an absolute blast in the other Washington. Kennedy's grave, the Tomb of the Unknown Soldiers, The Spirit of St. Louis, Gemini capsules, moon rocks, a scrap of fabric from the Wright Brothers first plane, Abe Lincoln's hat, Dorothy's Ruby Slippers, the first lightbulb/telegraph/telephone/computer, Carrie Bradshaw's laptop, Jerry's puffy shirt, Mr. Roger's sweater, Archie Bunker's chair, a hand-written recipe from Julia Child's kitchen, paintings by Renior/Monet/Manet/Degas/Andy Warhol/Van Gogh/Jackson Pollock, the Washington Monument, the Reflecting Pool, the Lincoln Memorial. Whew. Guess that's about it. Oh, and yesterday, I got to visit my sister on the set of a major motion picture. (I can't say what just yet... don't want to get sissy fired!) Yessir, I'm having a fine time. No mind-blowing meals yet, but I have high hopes for tonight: Got a table at Cashion's Eat Place. I was so moved by the warm tributes readers sent in about their favorite coffee places. There were poems and praise for baristas who warmed cups, doled out chocolate, gave up a kidney! That story was in The New York Times recently. I am dead serious. so many places we could see. we decided to go to Kauai. My favorite memory of the entire trip? Our daily visits to the Starbucks store! Holy grease trap Batman! What a nasty bit of business being flushed onto the streets of downtown Seattle this morning. After eating brunch, I stumbled onto a surreal scene. 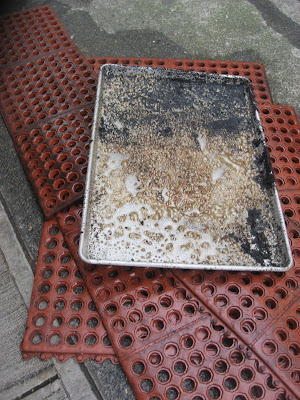 A grease trap being power-washed on a second story fire escape, the grimy water raining down into the alley, onto unsuspecting pedestrians. This pan was laid out on Senaca, near Fifth Avenue. Not the kind of scene you'd expect to see in a city that prides itself on its PC earth-friendly ways. This was blatant pollution. Or, am I hopelessly naiive? It sure put me off every eating at that particular place, a deli in the garage across from the Fairmont Olympic. Do restaurants routinely flush their waste onto the street? My column in today's Seattle P-I challenged readers to write a tribute to their favorite espresso hangout/barista/drink. I've had some great response so far, but the most inspired comes from Sue Maddox. A straight shot of dark roast love! 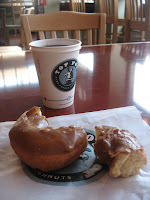 Stopped in at the new Top Pot this morning, and it's still got that new car smell. Just opened last Friday. The staff was welcoming, the doughnuts dazzling. One varieties twirled on a spinning plate. Mmmmm, dizzy doughnuts. I had a maple glazed cake because they were out of my fave, the old-fashioned chocolate. That's what I had yesterday morning at Starbucks. Was in the ubiquitous coffee titan checking out whether the retraining had magically transformed the chain. I can't lie, my drink was well made and the counter crew was so darned pleasant. Much rather buy my $4 cuppa at an indie. 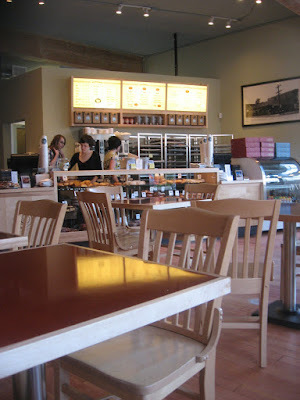 Love the Caffe Vita in my new hood, and Vivace on Cap Hill, and on and on. We're so spoiled in Seattle when it comes to coffee, but just try finding a sweet tea. Ain't gonna happen! We moved recently, and unearthed a box of old cookbooks I haven't seen in some time. One was stuffed with hand-written recipes from old friends, chefs I've profiled, generous readers. Many of these gems are yellowed and torn, splattered with batter. There's Melanie's verde sauce, Nell's wine cake, Nana's Peanut Butter cookies, Laurie's microwave peanut brittle. I have a recipe for polenta stars that were featured on "Northern Exposure" from Dahlia Lounge from the early '90s. Back when polenta was wildly exotic and Tom Douglas was just another chef. Found a really old recipe for buttery pound cake passed on with the recommendation I keep an eye out for recipes from Paula Deen. From that same era, I have a recipe from Marian Burros for fish tacos. When nobody dreamed of sticking seafood in a tortilla. It reminded me how far we've come in our food savvy-ness. These days, I continue to learn something new every day. But, a cold fact I find hard to swallow: Nobody writes out recipes on cards and shares them anymore. Or do they? Love to bring back that tradition!